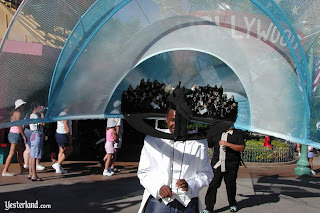 This weekend a small conversation on twitter lead to the discussion of Disney's California Adventure, the first attractions removed from it, and eventually the disastrous parade, 'Eureka!, A California Parade'. 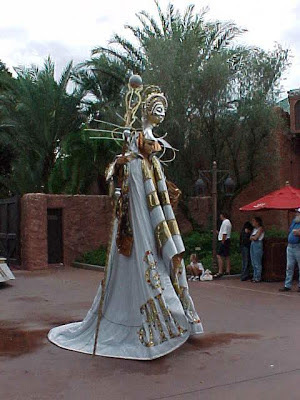 In the early millennium Disney created three similar parades, one that fell flat on their face, and two stand heads and shoulders above others. Eureka! 's influences comes from a parade 16 months old, located across the continent. LaughingPlace. Go see their awesome page on the whole Tapestry of Nations/Millennium Celebration! In October 1999 Disney launched the Millennium Celebration with new attractions, parades, shows, fireworks, and exhibits. Tapestry of Nations was the sleeper hit. Epcot's version of the Main Street Electrical Parade, it drew guests in night after night of their vacation. It was not unknown of guests to come down to see just this parade.The parade didn't have massive, complex floats or special effects. In fact, it only consisted of one float type repeated over and over again (see above photo for the Drum Unit). What Tapestry lacked in floats it made up for in puppets and the large cast. Tapestry of Nations Tumblr. It exists and it is amazing. 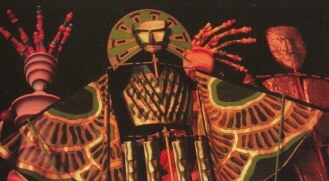 The parade spent 3 years in development, with music provided by Gavin Greenaway, puppets by Michael Curry, and show direction from Gary Paben. Over the 3 years the overall narrative, direction, and design changed, but the theme of a world collage of art stayed. Through development several puppets were designed but then discarded. Pay attention to these. Tapestry of Nations had a pace and movement seen through video and photos that cannot be duplicated. It must have been seen in person. Tapestry of Nations was something VERY special to not only many guests, but to my family. My family first saw this parade on my behalf in October 2000 after I bugged them to leave the Beach Club and walk to France, back between the quad and the river to watch the parade. Nobody in my family looked away or doubted me. We revised the parade within a year, and then again with the modified version of the show, and it's much lessened sequel. 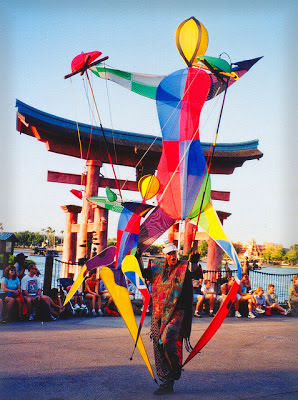 Tapestry of Nations, brilliantly, is three parades in one: three parade routes around the World Showcase Plaza make it appear to be one continuous parade, but it is not. These sections were Canada to France, France to Germany, and Germany to Mexico. This allows for a parade that isn't hours long and also fills up the walkways for the climatic 'Gateway of Time' segment. When all the puppets and floats are out, the lights around the promenade go out, while the mirror balls on top of the rolling percussion units wash starts over the puppets, buildings, and guests. Tapestry of Nations was a curative masterpiece of design and music. But it wrecked havock on the World Showcase Promenade. By the time WDI 'updated' the parade to feature Walt's 100th birthday, it became watered down and basterdized. Tapestry of Dreams (the third parade in this narrative) neutered the music, de-matured the narrative, and degraded the puppets. After the original Millennium run of the parade, Tapestry of Nations cut the Canada to France section due to the winds on the bridge between UK and France. This continued with Tapestry of Dreams, and by the end of its run, the parade was only running between Germany and France. Instead of the parade being about world unity and civilization, it's about children's dreams and stuff. 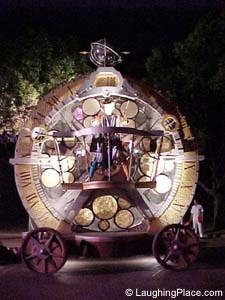 The Dream Catcher float with three characters replacing the Sage of Time and the first drum float. The characters are here to collect children's dreams and the puppets behind them are those dreams coming to life? 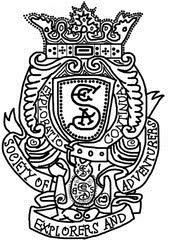 Something? It's not as clear as the 'Great Millennium Walk' theme of Tapestry of Nations. Plus, there's something about a guy on stilts that is lost when you have characters in spandex at eye level. The puppets received new 'personalities', with Disc Man and Hammer Man acting as jokesters wandering between the other styles of puppets. And in a decision similar go giving a 2 year old spoons and metal pots, all the puppets received various noise making additions. 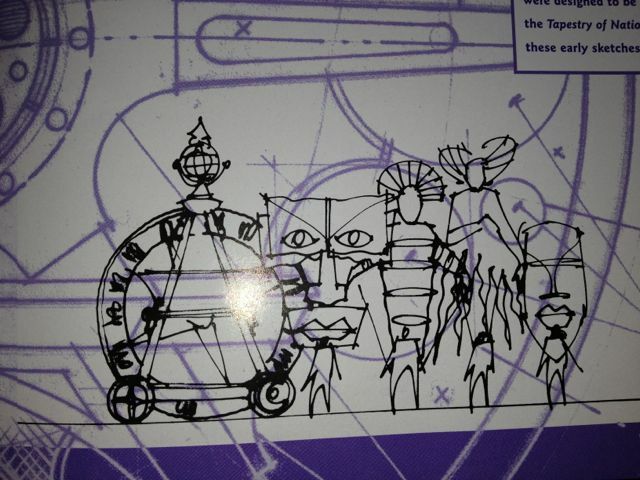 Cymbals, rattlers, bells, and chimes created a chaotic atmosphere that distracted from the puppets movements and music. Oh, and the music. Tapestry of Dreams remixed the original soundtrack to include children telling their dreams and awkwardly taking out the Millennium Celebration theme to put in something for the 100 Years of Magic. 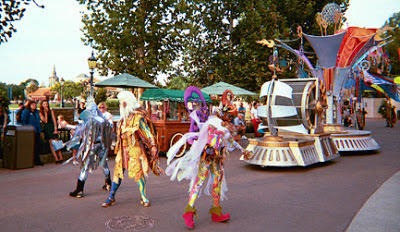 The WDI direction, the show managers, and the recession of the parade route all made sure this version of this beautiful parade would die, and quickly. These things replaced the majestic Sage of Time. WARSAW was contacted for crimes against humanity. Lets all celebrate the circle of humanity one last time, as we dance together, the drums, of the Tapestry of Nations. 'Eureka! 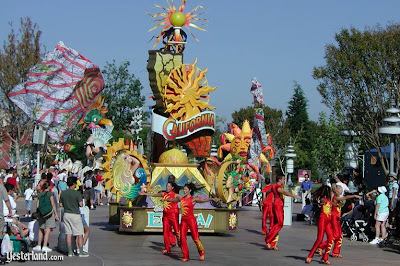 A California Parade' debuted at Disney's California Adventure in 2001. The second attraction to close (after the infamous Superstar Limo), Eureka lasted till the end of summer 2002. No final date is found online, as this parade was given a dogs death. Eureka was trying to mimic the Tapestry formula. There were drum units. the rejected puppets, the whole nine yards. It never worked. Instead of having majesty with a musical score and grand puppet designs, it had "Come Away With Me" and rejected Tapestry of Nations puppets added. 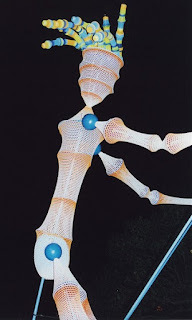 But Eureka shared a very important part of Tapestry of Nations, without actually understanding it: being minimalistic only works when you're surround with excess. Nobody with their right mind would consider Eureka a sleeper hit of DCA the first few years. Fewer would see it. Epcot had a promenade full of facades with shops, restaurants, and 'attractions'. The California Adventure 'performance corridor' did not. Yesterland. Seriously, a dude dressed at the Hollywood Bowl. Tapestry of Nations chose and was selective in its depiction of culture. There were examples of african metal working, aztec lines and headdresses, colors and shapes from France, and puppetry from Germany/Italy. Eureka seemed to grasp at any and all cheap and flimsy showings of California culture. A dude, with a head dress like the Hollywood bowl. A pair of stilt walkers as the Golden Gate Bridge. What Tapestry drew from influences to create something new, Eureka just stole whole cloth to create a kitsch sliver of California. The parade had a custom soundtrack by Bruce Healey. Unlike the Gavin Greenaway soundtrack, Eureka was stale and shallow. And because of the lack of a central musical theme, the show ended up hallow and weak. It was simply trying to ape the puppet and simplistic nature of the Epcot parade without fully understanding its nuances. My family, months after Tapestry of Nations, also saw Eureak. They saw no connection, unlike me. I don't blame them. At a first glance it's comparing a fine Jiko wine to two buck Chuck, but there is some connective tissue. Some, slightly. I will not try and to defend Eureka, it is bad. But it's a parade with a core of California, more than can be said of Tapestry of Dreams, than seemed to turn against its roots and ideals to simply provide something more 'accessible". It's weak, but still unique. Disney has experimented with the deconstructive parade. The idea of lights, characters, and massive floats is a new one. The opening day Disneyland parade shows the basis of the Tapestry of Nations style of parade. Main Street USA? Cowboys and Indians? Adventureland? Tomrrowland? Nothing fits. It's non-structured and heavily based on narration and theory. It's an Epcot parade. No dancing, twinkling lights or characters. But it all does fit. As no one culture, country, or culture fits, the Tapestry of Nations and Eureka parade is a purely Disney parade, through and through. What makes Eureka and Tapestry of Nations is a core theme: the collection of culture. Whether it be the nations of the world showplace or the cultures of California, the parades unique in celebrating the melting pot of culture of America. It's quite the shame after these parades 'we' dived right into a world where stereotypes and those counter stereotypes interact in Disney parks. No choice, you're either a Pirate or a Princess. Wouldn't it be great it if you could chose to be a Disc Man? Something I left out the original piece is some photos and video of the Tokyo Disney Sea 2nd Anniversary parade, Mickey's Fantastic Caravan, and their use of the Tapestry puppets. The parade uses direct lifts of puppets from the parade along with some lamer 'inspired by' designs. Watch for yourself below. Fun and interesting analysis. Yes, how we loved that Millennium parade. I found that if you stood where one started and another ended, you could basically see the parade twice in one session. I'd forgotten about "Tapestry of Dreams," and with good reason, as you note. Fortunately they still have the Illuminations fireworks, and I still have the parade soundtrack. Hi it's Alison from the Walt Dated World site. My page has a new address now so if you can update the links for the Tapestry of Dreams/Nations to waltdatedworld.com/id217.htm that would be great. (Also you might want to correct the spelling to Mouseketeer). Thanks.